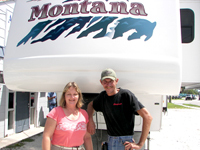 Adventure RV is Florida's west coast premier family owned shop that offers the best in quality RV Service and Repairs. We are the ones that You Can Count On! We offer complete bumper to bumper RV service and repairs with reasonable labor rates. Whether you need mechanical, interior, plumbing, gas, electric or roof repaired, We do it all. We welcome extended warranties and accept Visa, Master card, and Discover. Our goal is to create customer satisfaction that will keep you talking about the personal, professional service you received. People want to work with honest professionals they can trust and we want to be a part of your team.